Can be used for 3 CFL or led bulbs totaling to 50 watts. 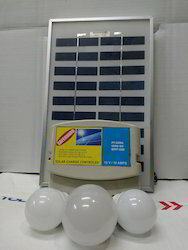 The set contains one unit ups, one 12 v 7 ah smf battery, one 10 watt solar panel. can be used for mobile charging as well.